Cape Cod. Vacation Home Rentals has listings for year round Cape Cod vacation rentals, exclusive Cape Cod rentals including Provincetown rentals, Cape Cod rentals with oceanfront property, and Cape Cod summer rentals. Western Massachusetts (includes the Berkshires). Concord and Lexington, just west of Boston. See where Thoreau stayed at Walden Pond in Concord. Follow Paul Revere’s fateful ride. Hancock Shaker Village in the Berkshires provides opportunities for unique sightseeing. Salem, north of Boston on the coast, has a chilling history worthy of a side trip or looking into rental property right there, depending on your appetite for scary stuff. Go hiking, fishing, or skiing in the Berkshires along the western part of the state. Visitors love reserving rentals minutes away from the slopes. Walk the Freedom Mile in Boston. Stay in a Boston vacation rental and save the rest of Massachusetts for another visit! With so many vacation rentals Massachusetts remains a favorite destination with visitors who return to their Nantucket rentals, Provincetown rentals, and Marthas Vineyard vacation rentals year after year. Vacation Home Rentals’ listings for Cape Cod oceanfront rentals, East Cape rentals, Cape Cod vacation rentals, and large Cape Cod rentals are extensive. Guests staying in Marthas Vineyard rentals and Nantucket house rentals love getting away from it all! Enjoy the Cape Cod National Seashore by renting Cape Cod summer rental homes or Cape Cod rentals available year round including great locations such as Chatham vacation rentals and Wellfleet cottage rentals. Guests staying in Cape Cod rentals and Falmouth Ma summer rentals enjoy nature trails and bike trails on forty miles of undeveloped natural shoreline. Cape Cod rentals include amazing Cape Cod summer rentals, Cape Cod vacation rentals available year around and Cape Cod rentals that can fit any budget. 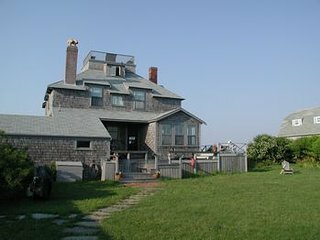 Many Cape Cod vacation rentals and Provincetown rentals are large enough for a family reunion or a wedding party. With so many wonderful vacation rentals, Cape Cod is a family favorite. In terms of summer rental property, CapeCod is a great place to look. Vacation Home Rentals has listings for East Cape rentals, Cape Cod summer rentals, Cape Cod rentals, and Cape Cod vacation rentals offering both ocean and bay waterfronts. Go golfing and biking while staying in one of the many fabulous Cape Cod cottage rentals. Guests with young children staying in Cape Cod vacation rentals often reserve northern Cape Cod rentals including Provincetown rentals because of the gentler water there. Visitors enjoying interpretive history will love Old Sturbridge Village. Ideally, look into vacation rentals in western Massachusetts. Guests staying in Boston rentals, can, however, make a day trip out to Old Sturbridge Village. Boston Museum of Fine Arts is a destination for many visitors. If you love the arts, look at rentals in the Fenway or Brookline neighborhoods of Boston. Quincy Market in Boston, off the Freedom Trail, has neat boutiques. Boston rentals will let guests enjoy colorful history, fascinating museums, and the intellectual culture in Cambridge. Hancock Shaker Village in the Berkshires offers the distinct opportunity to buy real Shaker clothing, furniture, boxes, and other handcrafts. Western Massachusetts rental lets visitors enjoy the Berkshires, world renowned for outdoor activities as well as their world-class spas. Stay in a Cape Cod vacation rental quick access to local hand made crafts. Cape Cod vacation rentals can make everybody happy! Kids enjoy the surf, sand, and sun. Local stores provide great shopping opportunities for Cape Cod rental guests when they have had enough sun for the day. 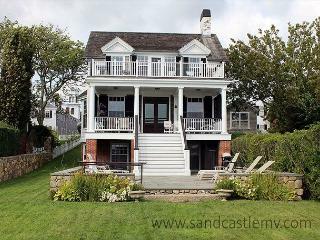 For many vacation planners, when thinking of a vacation rental Cape Cod is the only thing that comes to mind! Guests staying in Cap Cod rentals in the fall can experience Massachusetts’s cranberry harvest. Most Cape Cod rental guests find the red berries too tart and hard to eat straight; popular recipes include sauces and chutneys. Dried sweetened cranberries are added to everything from muffins to salads. Boston baked beans and brown bread (baked in a large tin) are two other popular dishes that guests in Cape Cod rentals venture out to enjoy. Visitors staying in Cape Cod rentals cannot come all the way to Massachusetts and not try Boston Crème Pie! Boston Crème Pie isn’t a pie at all but a yellow cake filled with vanilla custard and glazed with chocolate. Guests staying in Cape Cod vacation rentals during the summer are happy to escape the sticky heat further south. Guests staying in Cape Cod summer rentals usually experience summer highs in the mid 70s and lows in the low 60s. In the winter, guests staying in Cap Cod rentals experience winter lows of the low teens and highs in the high 30s. 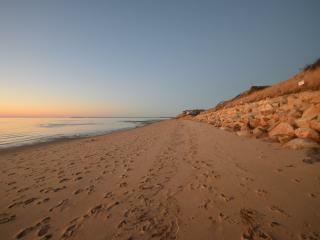 Guests staying in Cape Cod rentals in August experience autumn starting early. The fall foliage in New England is a big draw to tourists. Winter in Massachusetts is long, reaching from November through April. Winter sports enthusiasts bundle up and come to stay in one of the many rentals in the numerous ski areas in Massachusetts. 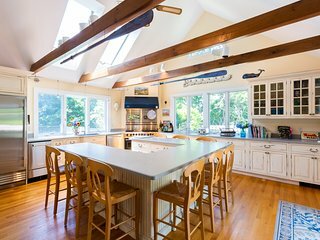 With so many vacation rentals Massachusetts has to offer, including Cape Cod vacation rentals, you are sure to find a location where you want to be. The problem is, you might have a hard time picking just one vacation rental. Cape Cod summer rentals and Nantucket rentals (including large Nantucket vacation rentals), all sound good! St. Patrick’s day festivities in Boston (March). Annual cranberry harvest festivals around the state (late September through October). A Massachusetts vacation rental can help you feel like a part of history. From the stories of the Salem Witch Trials, which have captivated our country's imagination for centuries, to its role in the American fight for freedom, through the Boston Tea Party, the Bay State has numerous stories to tell and secrets to share. 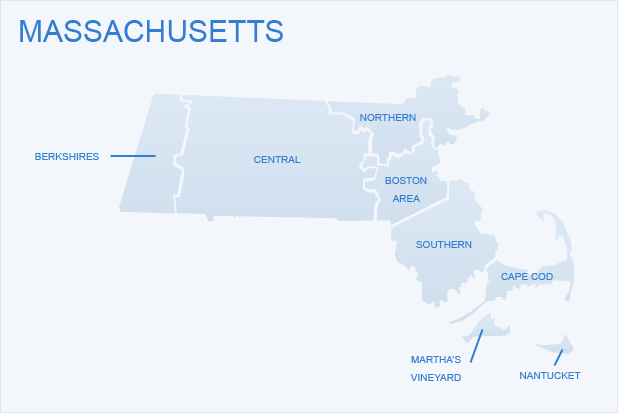 There are several distinct areas in Massachusetts, from the natural beauty of the western Berkshires to bustling Boston, and from the charming cape and islands to the culinary scene of central Mass, deciding what you want to do will help you choose a section of the state to visit. If you're looking for natural beauty, Royalston Falls makes a nice stop, as does the Cape Cod National Sea Shore. If you're looking for quintessential Americana, you can catch a movie at the Wellfleet Drive-In. From lighthouses to Revolutionary War battlefields, Massachusetts will keep you busy. Massachusetts is best explored by car to fully appreciate the different regions. However, if you're planning a beach vacation at the Cape or on Nantucket, you will do well with a bicycle. Boston's train and public transportation make a car unnecessary if you plan on staying in the area. During summer season, you can catch a jitney from Boston to the Cape. There's also a summer high speed rail line. The temperatures vary across the state. Massachusetts vacation rentals in the Berkshires will be cooler in the summer than ones in the center part of the state. Summers across Massachusetts can run from a balmy 70 degrees to temps in the 90s with humidity. Winter temps hover around freezing and snow is likely, with larger accumulations happening inland. You haven't experienced the nation's birthday unless you've experienced it in Boston. With a nationally broadcast fireworks display that lights up the air to the melodic tunes of the Boston Pops, it's definitely a bucket list item for a lot of travelers. Keep this is mind when booking your stay. Fall foliage is also an event in itself as the landscape seems to erupt in vivid oranges, reds, and yellows. Massachusetts is a leader in the farm-to-table movement with Berkshire Grown. Visiting the local farmer's markets and farm stands will give you a greater appreciation for fresh food. Culinary tourism is big in this state. The Bay State also serves up some of the freshest seafood available. You can buy it off the boat. Don't miss the lobster (lobsta, in these parts) rolls, which features big chunks of lobster wrapped in a velvety mayonnaise on a slightly sweet split-top bun. The clam "chowdah" is another taste you don't want to miss. Fall brings the opportunity to sample the sweet tang of apple cider. Who could leave the state without a bite (or several) of Boston crème pie? A Massachusetts vacation rental brings history and natural beauty to your doorstep. Explore the Bay State and sample the many differences in its regions. After your visit, you'll understand why the Pilgrims stuck it out.